For some, a grapefruit is an orange gone wrong, a more pleasant citrus with a dash of, I don’t know, quinine. The bitterness is a turn-off. But that’s what makes grapefruit one of my favorite fruits. Bitterness is dissonance, the bad flavor that makes the good flavors taste even better. The world of citrus is more fluid than most fruit families, subject to constant experimentation and mutation. The grapefruit itself is not all that old of a plant, emerging, probably naturally, in Jamaica in the eighteenth century as a cross between a regular orange and a pomelo. (Pomelos are those giant basketball-sized yellow-green fruits you often see in Chinese markets; they have an absurd amount of pith and taste sort of like an echo of grapefruit). Somehow the cross between a sweet orange and a very faintly bitter pomelo ended up magnifying the bitterness in the grapefruit. (The name, by the way, comes from the fact that when on the tree, the fruits grow grouped together sort of like giant grapes. It’s not a great name.) Grapefruit was only mildly popular until the early twentieth century, when a mutation causing a pink fruit was discovered in Texas. 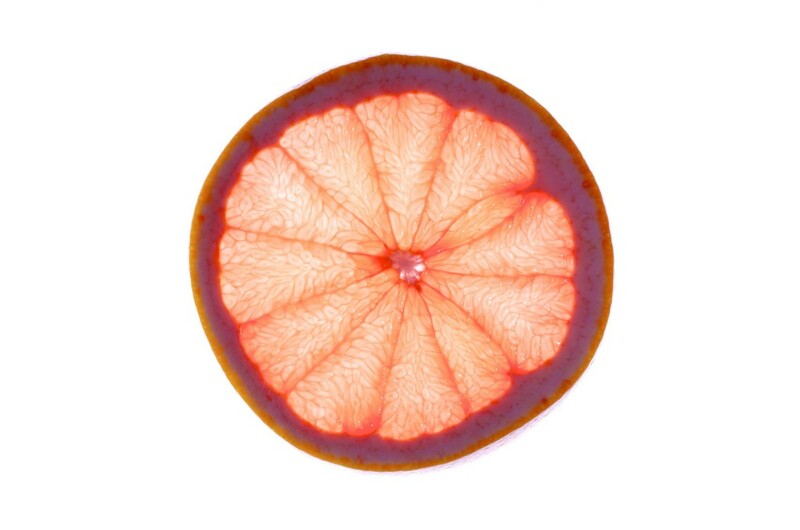 That mutation was exaggerated until it led to the Ruby Red grapefruit, a vibrant bright variety that doesn’t taste as good but looks much prettier than the original white. Most citrus is in season during the winter, so we’re comfortably in grapefruit season right now, which is great for us sad northerners because citrus is perky and bright and summery and cheerful in flavor and color. To pick grapefruit, they should be very slightly soft — nowhere near as soft as an avocado, but there should be a little give to them. More importantly, heft them in your hand. The heavier, the better. That means it’s converted more of its interior to sugar, meaning it’s sweeter and tastier. There are a bunch of different kinds of grapefruit. The Ruby Red is the most common, but it’s also the smallest and, in my experience, the most bitter; if you fear bitter, you should avoid the bright red variety and instead opt for the paler ones. The best is called Oro Blanco, a white variety with a bright yellow skin that has only a touch of bitterness and a whole lot of sweetness. An Oro Blanco doesn’t even need a sprinkle of sugar on top; it’s one of the sweetest fruits in the citrus family. Most other white grapefruits lean more tart than either the Ruby Red or the Oro Blanco. Pink grapefruits are somewhere in the middle. There are several ways that people eat grapefruit. One is by peeling it like an orange. Don’t ever do this. This method is difficult and messy, as grapefruit skin does not tend to pull smoothly away from the flesh, and it leaves you with a very high ratio of pith to flesh. The other common method is to slice it through the equator and pry out the segments with the aid of a serrated spoon. This is an okay method, which is kind of fun in the same way that shucking oysters yourself is fun, but it’s also kind of frustrating and leads to a lot of waste, because you’re smushing the fruit, losing juice as you go. Yes, I know you can drink the juice later. That’s fine. This method is fine. But my method removes that difficulty and gives you the benefit of practicing your knife skills at the same time. The nice thing about this method is that by the end, you’ll have perfect, pith-free grapefruit segments, just the fruit, with minimal amount of loss. You’ll get better and faster at this with a little time; do it a few times and soon it’ll only take you a minute or so. And you’ll be set up perfectly both to eat it plain, which is a very good way to eat it, or to cook with it. Grapefruit-avocado salad: Grapefruit takes especially well to certain fats, but the combination of grapefruit and avocado is one of those perfect magical pairings that I never get tired of. One of the first salads I really was proud to make is based on that combination. Take a light green — I like mache, but arugula will work, or one of those spring mixes, or even Boston lettuce — and tear into salad-sized pieces. Add in a chopped avocado, a grapefruit’s worth of halved grapefruit segments, a chopped bunch of something crunchy (jicama is excellent, radish and cucumber are both good), and shave some parmesan over the top. The vinaigrette: Chop a shallot and let it sit in some red wine vinegar for 15 or 20 minutes. Squeeze in some leftover grapefruit juice (or, honestly, any citrus; orange is good too), a squeeze of mustard, and a touch of sugar. Mix thoroughly while drizzling in some olive oil until you’ve got the right balance. This salad goes well with grilled or seared or roasted chicken. Ceviche: When you think of ceviche, the marinated (often raw, or at least sans heat) seafood dish, you probably think mostly of lime juice, but grapefruit works really well too. Here’s a recipe I shamelessly stole from Rick Bayless: Get good quality seafood (I usually do shrimp, squid, and a white fish like striped bass), clean it, and put it in a glass bowl. Squeeze enough grapefruit juice to cover and let sit. In a dry, medium hot cast iron pan, throw in some unpeeled cloves of garlic and a few dried medium-spicy chiles. When the chiles are fragrant but not burnt, put them in a bowl of lukewarm water. Keep the garlic going, turning occasionally, until it has some black spots on it and is soft. After about half an hour, drain the dried (well, now rehydrated) chiles and put in a food processor with the garlic, some of the grapefruit juice that’s been marinating your seafood, and some brown sugar. Blend until smooth and add salt to taste. Drain the seafood entirely and add some chopped jicama or radish (perhaps a winter radish??? ), some mango if you can find a good one, and some chopped cilantro, and then pour your pureed sauce over it. Eat with tortillas or tortilla chips. Caramelized grapefruit: You can also cook grapefruit, although not many people do. An absurdly easy one is to just take the typical “add sugar on grapefruit, eat” and add heat. You can broil it — just add some brown sugar to the cut halves of a grapefruit and stick them under the broiler for a minute or two — or you can do it in a pan. Throw some brown or raw sugar in a cast iron pan on medium heat, stir frequently until it begins to melt into a caramel-like substance. Put the cut hemispheres of the grapefruit in the pan, cut side down into the sugar, and cook for a couple minutes. Top with mint and a touch of salt. Ridiculously easy, absurdly delicious. Another salad: But maybe my favorite thing to make, a real simple dish that’s just like, hey, grapefruit, you’re good as hell, is a citrus salad. Get whatever citrus you can get, leaning towards the prettier ones like cara cara orange and blood orange, plus a bunch of grapefruits. Supreme them all. Toss in a bowl with a little lime juice, olive oil, honey, salt, and chopped basil. Serve. Grapefruit is probably not for everyone, and I won’t bother with the “you’ve never had a good one” thing. It’s a divisive fruit! Lots of people don’t like bitterness with their citrus. But I think when you combine it with caramel, or avocado, or olive oil, or chiles, it adds a really nice complexity to a dish that would seem flat if you substituted a simpler citrus like an orange. Also, the first person to mention that “grapefruiting” video will be the subject of an elaborate curse that will turn all fruits into the worst versions of themselves. All apples will taste like Red Delicious from a middle school lunch tray. All melons will taste like pre-cut supermarket honeydew. It is the worst curse I could come up with on short notice.